As the warmer months approach, so does the threat of fires. 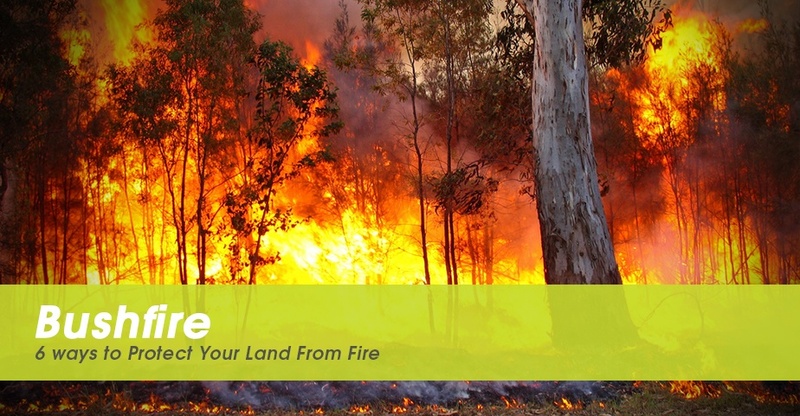 It is important to ready yourself and your property in the lead up to fire season in Australia. In order to be best prepared in the event of a fire, we have put together a helpful list to help you do just this! Just one spark is enough to start a fire so always make sure all machinery is well kept. Any damage or exposed electricals can be a disaster waiting to happen especially as the weather heats up. Spark arrestors on machinery can cut the potential for danger substantially so always ensure that these are working. It is essential to kit yourself out with a range of portable and easy-to–use firefighting equipment and ensure that everyone on your farm knows how to use it. Fire extinguishers and knapsack water tanks are recommended for rapid response to any fire. Remember it is no good to have these items and keep them stored away, make sure they’re in plain sight and easily accessible if fire strikes. Make sure all roofing on your land is well maintained. Sparks or burning embers igniting under tiles are a common fire starter that can be easily prevented. Ensure all damaged roofing and weatherboards are fixed or removed as embers can easily enter via these. Metal roofing is recommended as it offers more protection against this with more security around vents, windows and roof caps. This simple step could make a huge difference in saving what’s important to you by stopping a fire in its tracks. As the season approaches mowing, cutting and ploughing along key boundary lines and around buildings can be vital. With less combustible material this can prevent a fire from entering or spreading around your property. Work with neighbours or surrounding land owners to optimise fire breaks to be as effective as possible. Any easy step for any home or land owner is to clear combustible debris. Dry grass, leaves and stacks of firewood are just some of the common items that can prove deadly. It is vital to check gutters, vents and other places where these materials may build up that could provide a quick and flammable entry into your home. You should also consider removing decking and wooden fences, as these can easily allow a fire to grow enough to destroy your whole premises. Always have a plan for moving high-risk stock such as straw and hay. Getting this to a safe place is essential for ensuring the fire does not grow out of control and also protects valuable materials. Pre-plan a strategy to move items as quickly as possible in the event of fire. Make sure everyone is on the same page and, first and foremost, know how to protect themselves. The above steps could be crucial in saving you and your livelihood. For more ways to protect your farm or land against fire see the CFA website. At Trans Tank International, we offer a range of firefighting equipment from slip on tanks to portable firefighters to ensure you’re prepared as the risk increases.